Brexit, the U.S.-China dispute, and the possibility of U.S. auto tariffs mean the world economy faces substantial threats to free trade. 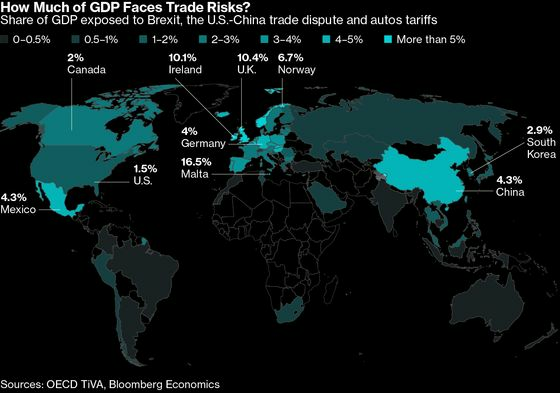 Running the numbers on a unique data set from the OECD, Bloomberg Economics calculates that some 2.3 percent of global gross domestic product is tied to trade flows that are at risk from greater protectionism. Within that, the U.K., China and Germany are the major economies that face the biggest risks.